In the commercial and industrial transportation sector, reliability in terms of power is critical. Whether it’s an airport, rail system, seaport or a road tunnel, all have critical power needs around requirements including safety that are driving the need for modern, industrial UPS systems. It’s similar at airports, where many of the same critical applications apply, along with lighting for the runways, airfields and terminals; air traffic control systems; passenger boarding systems; ticketing and payment systems; baggage handling and screening systems, and more. As transportation companies look to digitize and integrate their various systems, it’s all the more important that they maintain near 100% availability of power. Should any link in the chain fail, it could disrupt the entire operation. Ensuring that 100% availability means all these critical systems must be protected against power failures by an industrial UPS. And ensuring the UPS will be able to do its job when called upon means paying attention to the UPS batteries that supply temporary backup power. UPS batteries, like the battery in your car, can lose power over time, so it’s critical that transportation companies monitor their UPS batteries and identify any that are near end of life. Grid power availability and quality is unstable in many countries, forcing UPS batteries through multiple charge and discharge cycles. Over time, that can cause a loss of capacity as well as longer charging times, putting the batteries in jeopardy of not being able to handle a failure. Newer technology is designed to optimize charging time and power to ensure the UPS can handle the loads it needs to support in case of a power failure. Chargers are designed to deliver higher charging current, so batteries are ready to deliver. 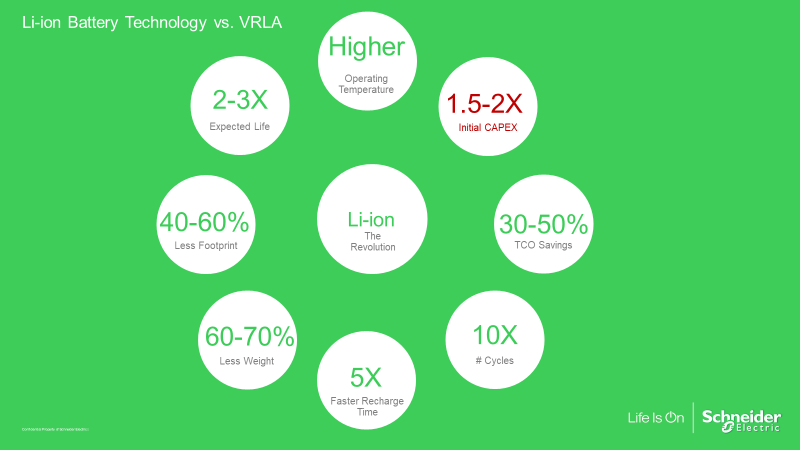 The biggest challenges faced by customers using valve-regulated lead acid (VRLA) batteries is operational expense (OpEx), because they have to replace the batteries every 3 to 5 years. To extend battery life, modern industrial UPSs include a battery management system (BMS) that continually monitors the status of all UPS batteries at the cell level. The BMS protects against excessive battery discharge, limits battery current, and ensures each cell is charged to its expected voltage. The BMS can also send an alert about any batteries that are in need of attention or replacement. Most provide status via indicators on the UPS itself and can feed status data to a remote monitoring system, for centralized management. Lithium-ion (Li-ion) batteries are another emerging option that can help transportation organizations ensure 100% availability for critical applications. Li-ion batteries have a far longer battery life – around 10 years, vs. the 3 to 5 years for VRLA batteries. In addition to improving reliability, that reduces the burden and cost of battery replacements and maintenance. Li-ion batteries also have a built-in BMS. What’s more, Li-ion batteries can also withstand greater temperature fluctuations without sacrificing performance. The rule of thumb is that VRLA battery life is reduced by half for every 10°C (18°F) increase above 25°C (77° F) ambient temperature. 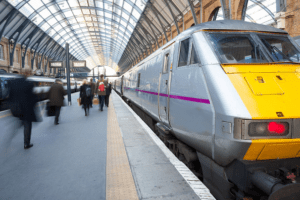 Li-ion batteries can accept spikes in temperature up to 40°C (104°F) with less effect on battery life – an important consideration in the sometimes harsh environments typical of some transportation facilities. Of course, industrial UPS batteries are just one piece of the puzzle when it comes to providing reliable power for critical systems in the transportation industry. To learn more about what it takes, visit our Industrial Business Continuity site.